A long time ago I announced, that there is a "last Gentleman Bartender" called Angus Winchester. From today - the Traveling Mixologists are proud to have a "royal" bartender as well! prepared today the famous GIN HOT PUNCH for HRH Prince Charles. 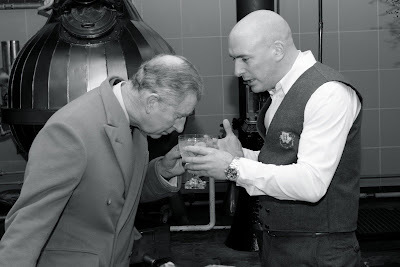 Prince Charles had his first Hendricks Gin ever and he let "SIR" Xavier know - that he likes his Gin Martini with a twist of lime.